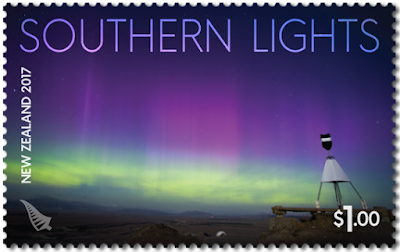 Virtual New Zealand Stamps: 2017 Southern Lights. Auroras (Southern Lights), are the result of electrically charged particles from solar winds reacting with gases in the earth’s atmosphere. 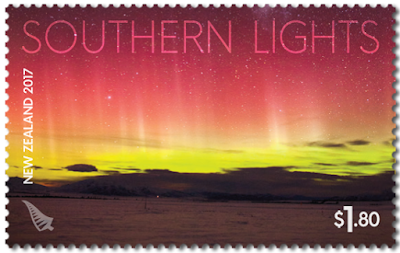 The excess energy from these reactions creates a stunning light show that can be seen at the North or South poles. In order to view the Southern Lights you would need to be as far South as possible, which is part of the reason that New Zealand is such a prime location for viewing these colourful displays. 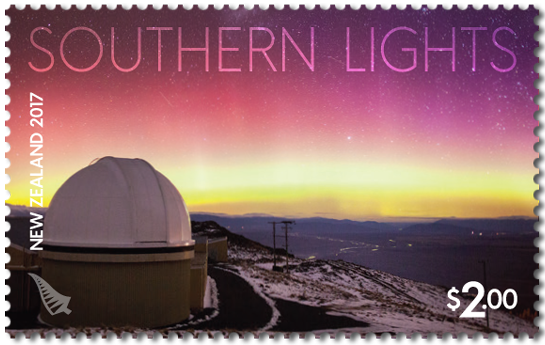 This stunning stamp issue features six gummed stamps - each featuring a photograph of the Southern Lights, taken at the Aoraki Mackenzie International Dark Sky Reserve. 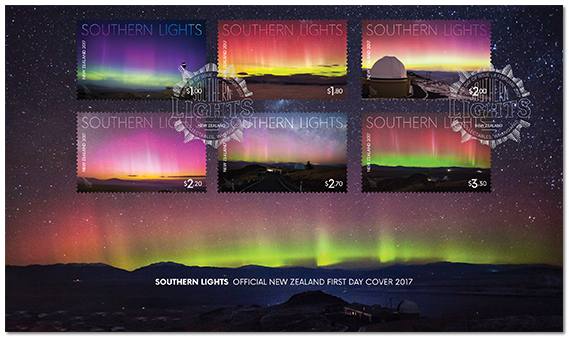 Each stamp shows a different view of the Southern Lights, with the various colours and patterns of shimmering light clearly evident in these stunning photographs. As would be expected with an issue such as this, the stamps are of a very simple design with minimal details and text, the amazing photographs being the star attraction. No information is given about the photographs other than that they were all taken in the Aoraki Mackenzie International Dark Sky Reserve. Southern Lights - Miniature Sheet. 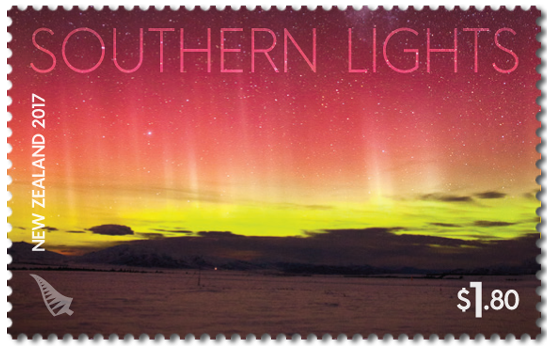 The stamps from this miniature sheet are printed using a special silver-foil, replicating the shimmering effects of the aurora. 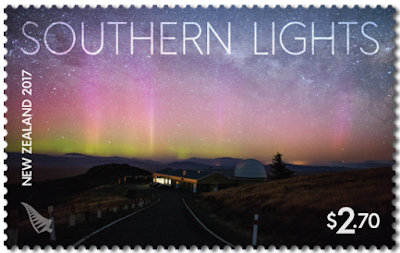 It is nice to have a miniature sheet that does not completely duplicate the set of stamps for a change and this one, and indeed the six sheet stamps, works well – a most pleasing set. 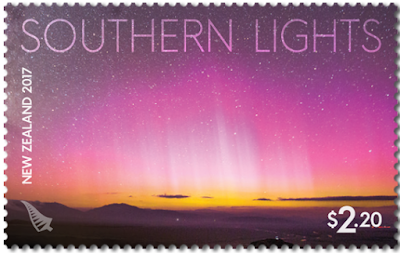 Southern Lights - First Day Cover. 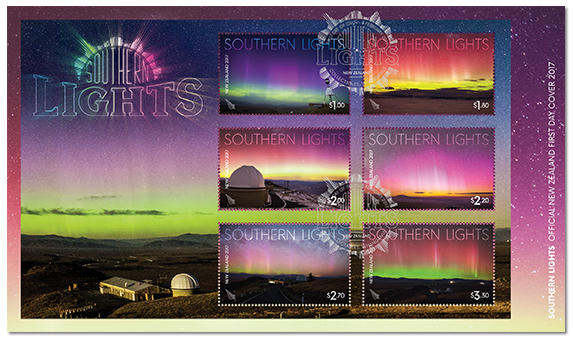 Southern Lights - Miniature Sheet First Day Cover. 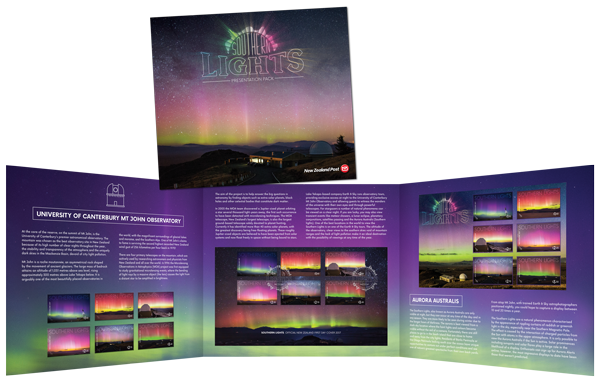 Southern Lights - Presentation Pack. 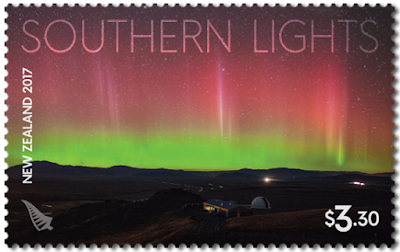 Unless stocks are exhausted earlier, these stamps will remain on sale until 7 February 2018. First day covers will remain on sale until 7 April 2017.